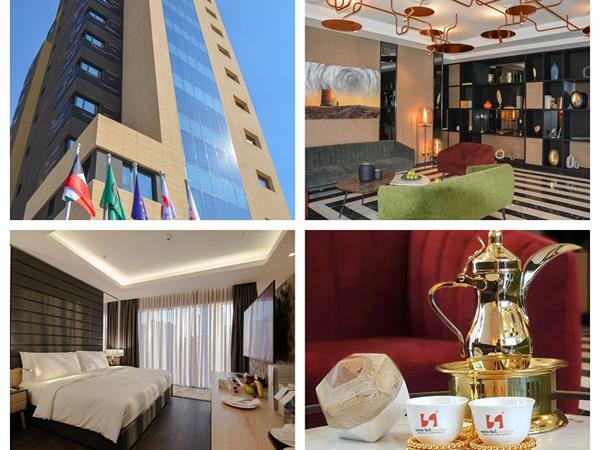 Featuring stylish and spacious rooms and suites equipped with top-notch facilities, this modern hotel is conveniently situated merely 18 km from Kuwait International Airport. Being in a vibrant neighbourhood, the hotel is well surrounded and is only 3 km away from the Grand Mosque, 2 km from Al Hamra Business Tower, 2 km from Souk Sharq, 1.5 km from Kuwait Towers, 3 km from ministry complex, 30 km from Oil and Gas arena and 16 km from The Avenues shopping district. Designed to stir your soul and elevate your senses, Swiss-Belboutique Bneid Al Gar strikes the right balance between comfort and style. Our accommodation choices come with facilities and services that will leave you truly relaxed. Each room is equipped with an extensive array of amenities including satellite TV, free Wi-Fi, minibars and, tea and coffee making facilities. Additionally, the suites offer beautiful living areas, bathtubs and balconies where you wake up with panoramic beach, bay, city and garden views. Beautifully designed and decorated in modern style with creativity that connects and plenty of space to work and relax, many offer breath-taking views over the beach and bay while others provide panoramic city and garden views. Discover our superb restaurants that include Terrazzo serving authentic Lebanese cuisine with shisha and Swiss-café offering an awesome international all-day-dining experience. When in need of a break or simply on the go, stop by the café in the lobby to enjoy our signature refreshments and variety of hot and cold beverages any time of the day. Swiss-Belboutique Bneid Al Gar Kuwait offers travellers a wide array of conveniences and facilities. To refresh your mind and revive the soul, we have a fabulous health club with a fitness center, sauna and outdoor swimming pool. Visitors to Kuwait City will be surprised by its unique attractions including excellent museums and galleries, souq and corniche with scenic beaches. Swiss-Belboutique Bneid Al Gar Kuwait is ideally located across the street on Kuwait City’s beachfront promenade overlooking the beautiful Kuwait Bay.